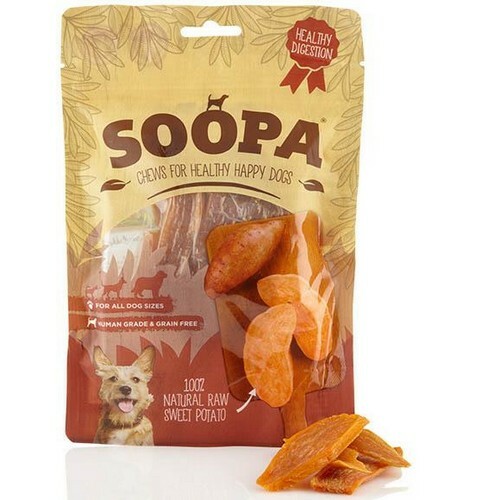 Soopa 100% Natural Sweet Potato Dog Treat's are a delicious healthy chew treat for your dog. Naturally rich in vitamins, minerals and anti-oxidants with their rich orange colour indicating that they are high in carotenoids such as beta carotene and other carotenoids. Research shows carotenoids help strengthen eyesight and aid immunity to disease. One of nature’s superfoods, sweet potato contains good bacterium that helps to regulate the digestive tract and help animals with sensitive stomachs. Sweet potatoes are naturally sweet-tasting but their natural sugars are slowly released into the bloodstream, helping to ensure a balanced and regular source of energy. 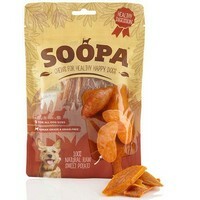 Suitable for dogs over 4 months of age.